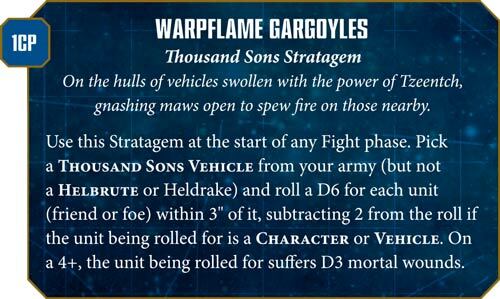 Warhammer Community has a Thousand Sons Faction Focus today! WOOHOO! Time to bring on our psychic shennigans! As Thousand Sons will be my 4th (and next) army, I'm looking forward to seeing what I can do with them. My Rubric Marines, Scarab Occult Terminators, Exalted Sorcerers and Mutalith Vortex are on the way, and depending on the codex, I might buy a bunch of Tzaangors to get a Brigade Detachment. If that's not feasible, then I'll just run an army made entirely of psykers (and the Mutalith Vortex)! The Thousand Sons have always been my favorite Legion. Blame their psychic powers. Or blame me for reading A Thousand Sons by Graham McNeill. That was one of my favorite Horus Heresy books, next to Mechanicum (also by Graham McNeill). And I enjoyed the Ahriman Collection tremendously. I'll get the Battle of the Fang soon, after I finish my current log of Gaunt's Ghosts books. We'll see. Anyway, what do we get for our Legion Trait? Buffs to our psychic powers! 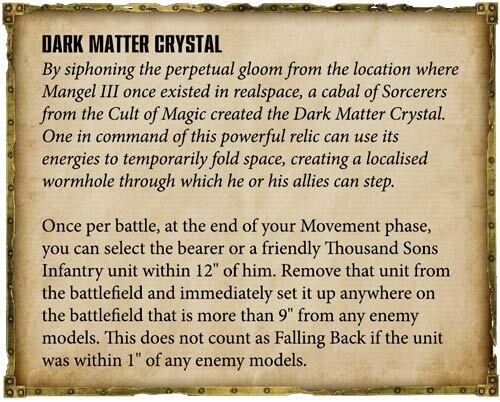 While I'm a bit disappointed it's not re-rolls of psychic tests or add stuff to our psychic tests, I'm glad it's not a copy-and-paste of the Grey Knights Chapter Tactic. Plus 6" buff is pretty good - we can Smite from 24" away now, which is bolter range. Not bad. Not only that, we have access to three psychic disciplines. Dark Hereticus from Codex: Chaos Space Marines (I'm so gonna use Warptime for my Rubric Marines! 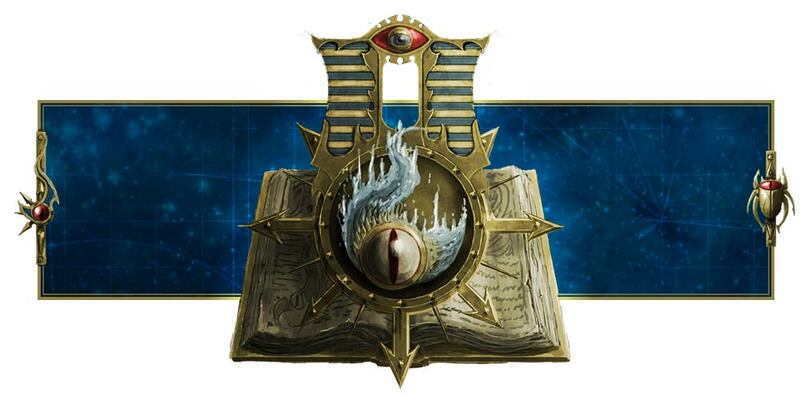 ), the Discipline of Change and even the Discipline of Tzeentch from Codex: Chaos Daemons. Take note, the 3rd is for Daemonic sorcerers only, such as Daemon Princes of Tzeentch and Magnus, and perhaps Sorcerers on Disc (we'll see). The Aspiring Sorcerers, Exalted Sorcerers on foot and Scarab Occult Terminators most likely will not be able to take the Discipline of Tzeentch. Oh, and the Tzaangor psykers too. So what psychic powers do we have from Discipline of Change? 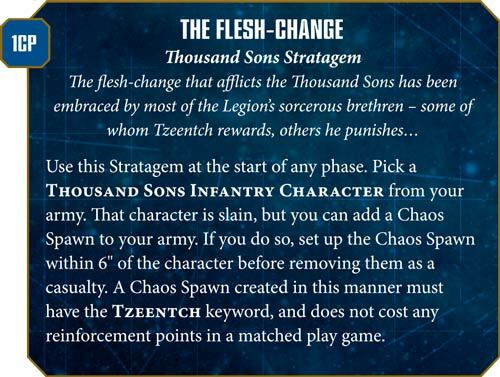 The first is Glamor of Tzeentch, which basically gives our units protection from enemy units in the form of giving the enemy units a -1 penalty to their hit rolls (both shooting and fighting) when they target them. Awesome. And then Doombolt is back! WOOHOO! Time to dish out mortal wounds! However, Doombolt is pretty expensive at 9 warp charge. D3 mortal wounds are awesome, but it also has the added bonus of halving the target's movement characteristic and prevent them from advancing. Cool. But with a warp charge value of 9, I doubt it's unlikely to go off, and furthermore we don't seem to have any bonus to casting psychic spells. Oh well. That's not all. We also have awesome Stratagems! Remember I have a unit of Rubric Marines armed with nothing but warpflamers? Yeah! 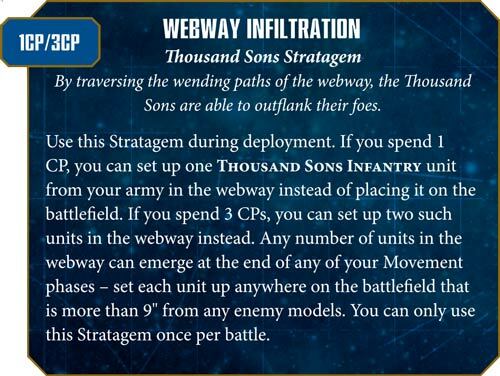 Even though they're slow as feth (I've been spending too much time with the Tanith), I can use this Stratagem, Webway Infiltration, to Deep Strike them 9" away from the enemy, and then cast Warptime on them and unleash lots of hellish flames on the enemy! This will melt hordes into they who must not be named! With this Stratagem and relic, we can Deep Strike potentially up to 3 units! Imagine Deep Striking a squad of 10 Rubric Marines with warpflamers with Dark Matter Crystal, and then having 2 more Rubric Marine squads with inferno bolters get within 9" of the opponent with Webway Infiltration. And also Deep Striking yet another unit of Scarab Occult Terminators next to them. That's four dudes that can fire and then charge! It's too bad we can't Deep Strike monsters and vehicles like the Mutalix Vortex Beast and Maulerfiend, though. That said, the Maulerfiend is still awesome for Thousand Sons! Let's buff him with this other Stratagem! Ha ha! Nice! This guy will be dishing out a lot of stuff to hordes! 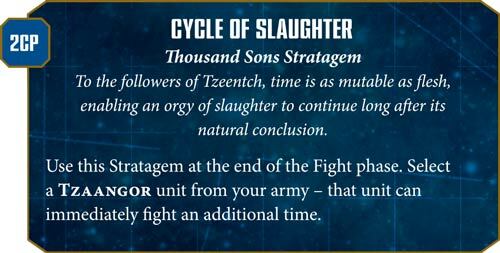 Tzaangors also get their own Stratagem, which is pretty neat. 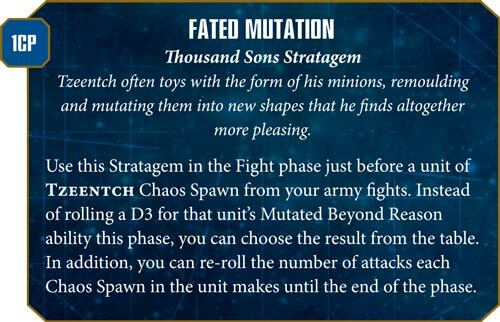 Chaos Spawn also get to be useful with Stratagems, but I'm not exactly fond of using they who must not be named...gaaah! Well, seems useful if you have a Sorcerer or Tzaangor Shaman with only one wound left and is about to die (or locked in combat with an enemy). Cast a psychic spell, kill him (since he can't shoot if he's forced to fall back), then throw a Chaos Spawn somewhere 6" away, and then charge the enemy with it. Heh. That's all the information I have for now, and I'll certainly be looking forward to playing with my Thousand Sons army once they're shipped to me!